Over the past year or so, I’ve gotten to know Joe Linton as an advocate for biking, walking and transit in L.A. through our work together on the board of the Southern California Streets Initiative, the non-profit publisher of LA Streetsblog. But there’s another side to Joe beyond advocate — that of writer and graphic artist. 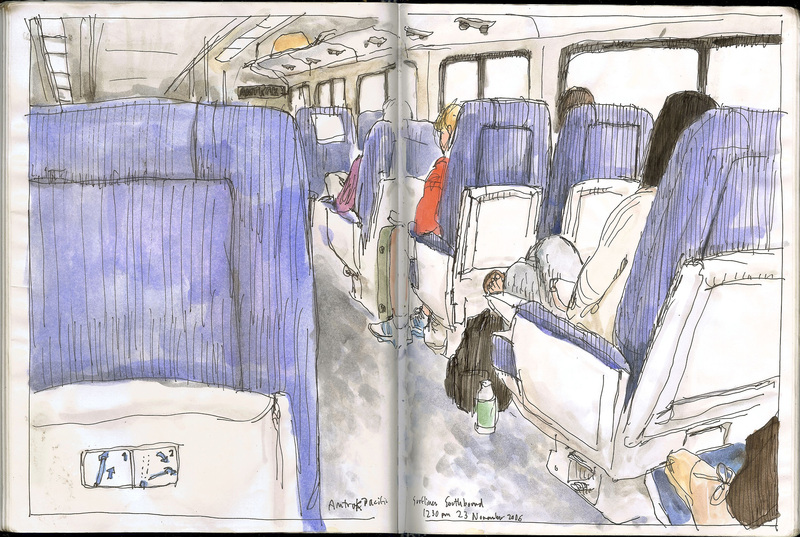 Joe recently offered — and I gladly accepted — to share with The Source some of his drawings of life in transit, as well as his thoughts about the process and the meaning behind his work. Below is a selection of Joe’s extensive sketches along with a brief interview we conducted over email. Northbound 266 from Long Beach to Pasadena. July 2, 1994. All sketches by Joe Linton. Carter Rubin: What is it about people riding transit that you find particularly interesting as a subject? Joe Linton: I tend to enjoy drawing people. 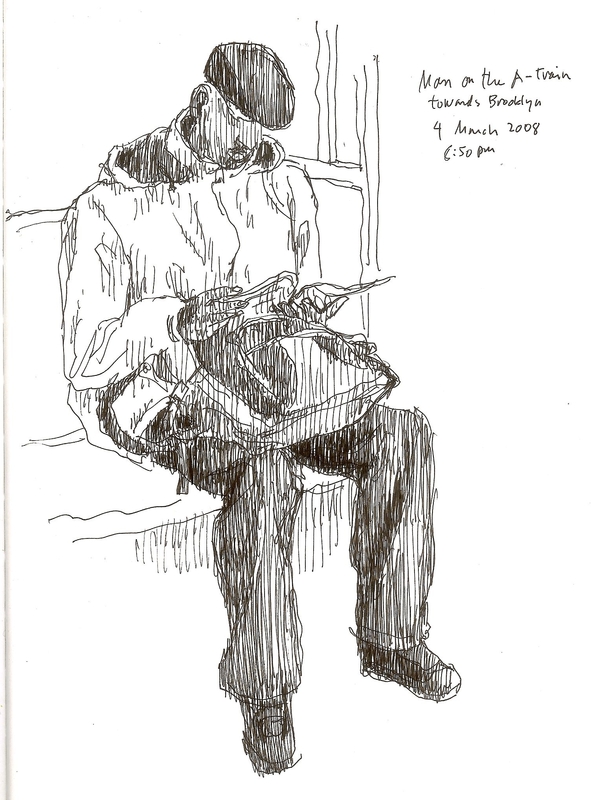 When I ride transit, I have time on my hands (both on-board and when waiting) and the person across from me is generally holding relatively still, so it’s an opportunity to draw from a live model. Generally I think that green transportation stuff — whether bus, bike, rail, pedestrian, CicLAvia, etc. — is more about bringing people together than it is about the infrastructure itself. Transit makes common public space where people come together, where we look each other in the eyes, and acknowledge each other’s humanity. 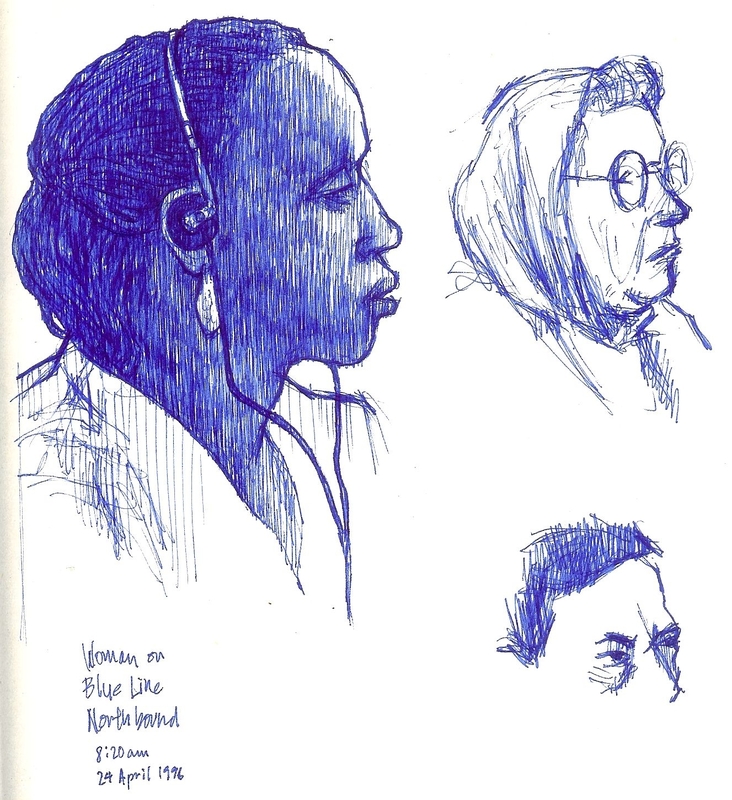 Woman on Blue Line Northbound, 8:20 a.m. April 24, 1996. CR: How does transit — and the people riding it — differ as a subject from other subjects you’ve captured, i.e. the natural environment, architecture, etc.? JL: I tend to do most of my drawings of stuff just made up out of my head — inventions (though none of these are posted here — you can find them at my art blog). 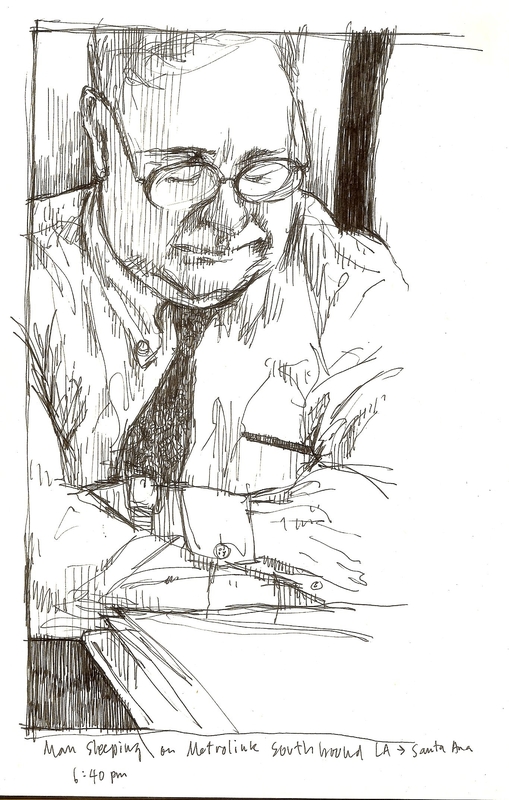 Drawing folks on transit allows me to observe real people. When I am just drawing from my imagination, I tend to make up crazy-looking distorted grotesque people. Drawing folks on transit grounds my drawings a bit more in reality. I do enjoy drawing cityscapes and landscapes, too. But I’d guess that something around 90 percent of my drawings are of people. Man Sleeping on Metrolink Southbound, LA to Santa Ana. 6:40 p.m.
CR: Do you notice anything different about travelers when they’re on local buses, trains or long distance Amtrak lines — what they’re doing, who they appear to be? JL: I do notice some general class and race differences – i.e. Metrolink tends to carry a somewhat whiter and more white-collar worker — compared to most bus lines that carry more Latinos and African-Americans and more working class, but you never know. There are some differences in how long the average rider stays in one place. I used to ride the Metro Blue Line all the way from Long Beach into L.A. during commuting hours, and folks getting on at the outer end of the line almost always traveled all the way to downtown. This long commute gives a sketcher time to do a relatively-finished image. Lately I work out of my home, and take transit to meetings and events. I travel weekends and during the day — hours not strictly for business commuters — so there’s less predictability. All kinds of people get on and off all the time. I have to sketch quicker, because the person I am sketching could get off at any stop. Eastbound LB 101. March 25, 1992. CR: Do you notice anything about how people interact when they’re on transit versus in other shared public places? JL: There’s a little interaction — people observe who’s around them — but I think that most of the time most people stick to themselves [even though] we are sharing space, seeing each other. Lots of folks are tuned out to electronic devices. Sometimes folks will spot me drawing and ask to see the sketches in book, which I enjoy showing off. But most of the time, I prefer to sketch without my subject knowing that she/he is being sketched. Man on the A-Train towards Brooklyn. March 4, 2008. 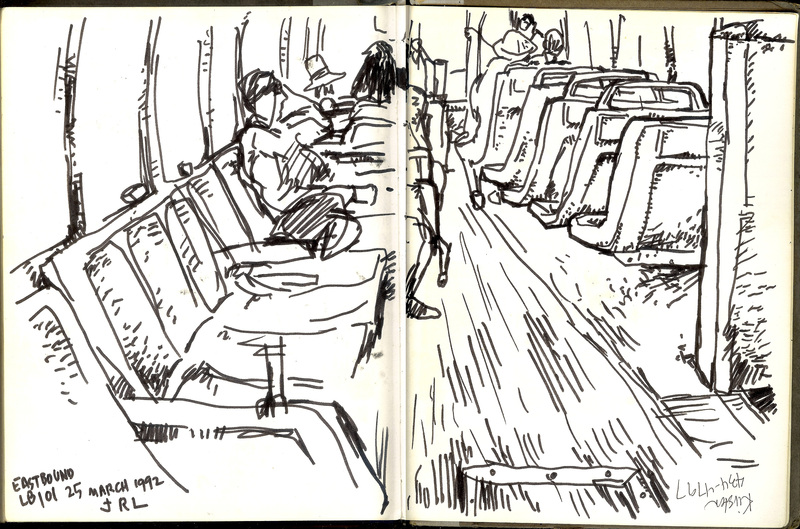 8:50 p.m.
CR: What’s the greatest challenge artistically about drawing/composing on transit? How does this differ from other subjects — i.e. the constant movement of the vehicle and people? And how does it affect your compositions? 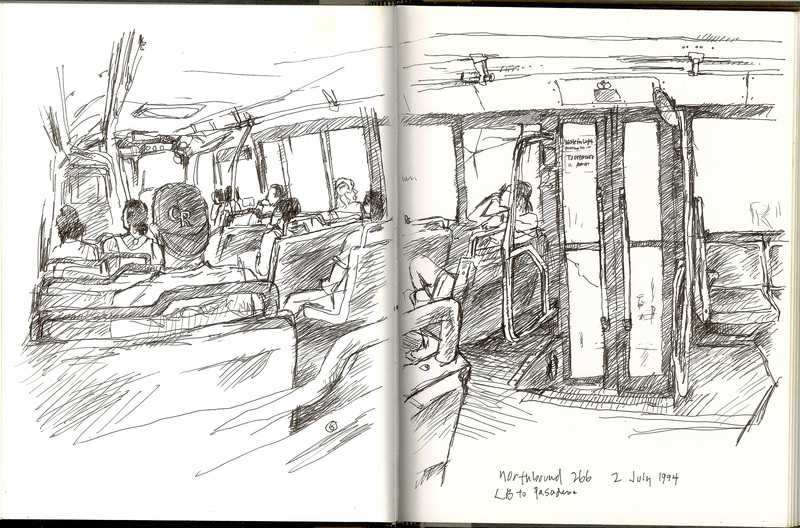 JL: I think, for me, sketching on transit is really good practice. When I work on artwork at home, my drawings can get really detailed and precious and tight. When I am on the bus, it’s shaking a bit and the person I am sketching could get up at any moment, so I have to let the drawing flow fairly quickly fairly decisively, and to not be heavily invested in perfection. Any single line can be a bit off, but overall the drawing can come together. I generally sketch directly in pen, with no pencil underneath. It all goes quickly, and gets me to be fairly loose and spontaneous, which tends to result in better artwork than when I get excessively tight and detailed. Amtrak Pacific Surfliner Southbound 12:30 p.m. November 23, 2006. Joe Linton is an artist, author and urban environmental activist, living at Los Angeles Eco-Village in Koreatown. Linton currently works as an organizer for the non-profit CicLAvia. He has worked at various non-profit organizations including Friends of the L.A. River, the Los Angeles County Bicycle Coalition, C.I.C.L.E., Livable Places, and others. Linton wrote and illustrated Down by the Los Angeles River: Friends of the Los Angeles River’s Official Guide, published by Wilderness Press in 2005. Linton blogs at L.A. Creek Freak, L.A. Eco-Village, CicLAvia and posts his artwork at Handmade Ransom Notes. Those sketches are pretty cool! Fellow Occidental College Alumni and fellow bicycle enthusiast, I am glad to see Joe Linton’s talents; contributions to the bicycle community as well as artistic expressions of LA’s public transit. Io Triumphe! Thanks for the kind comments – and for the article, Carter!